Despite being at home on an airport conveyor belt, accountants have felt the need to adopt the roller bag as one of their own. Roller bags and other fugly equipment (such as fax machines) have become mainstays in the office. 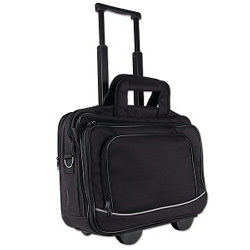 A roller bag, pictured here, is the Frankenstein of office companions. It is part laptop case, part airline traveler, and always awkward. Is the accountant using one really trying to get work done? Or are they trying too hard to lug around work that they need expandable zipper compartments? For men, a traditional, conservative leather portfolio case would suffice. For women, they have an infinite number of options that doesn’t involve this fashion faux-pas. A roller bag tells the world that an accountant likes to take around their office – workpapers, binders, and manuals with them – everywhere, all the time. This uncompromising attitude is impressive until you realize that the only thing the accountant has is a good workout. Most of the things in there are simply for reference and unnecessary. Does any of this seem confusing for accountants? Below is a simple test to determine if what they are using to store their laptop and documents is the fashion equivalent of wearing Crocs. Does it have an retractable handle? Any ‘Yes’ answers should result in a punishment of having to carry around the laptop, charger, and binders by hand for a week. Accountants are already overworked, underpaid, and socially-inept creatures. Whoever started this trend of needing to cart around junk on wheels needs to do a rotation into governmental accounting. Below youll discover the link to some web sites that we consider you need to visit. That would be the end of this article. Here youll find some internet sites that we assume you will appreciate, just click the links. We like to honor a lot of other net web sites on the internet, even when they arent linked to us, by linking to them. Under are some webpages really worth checking out. We prefer to honor a lot of other web sites around the net, even when they arent linked to us, by linking to them. Under are some webpages really worth checking out. That could be the finish of this report. Here you will uncover some web pages that we think youll enjoy, just click the hyperlinks. That may be the end of this article. Right here youll discover some web pages that we consider you will enjoy, just click the hyperlinks. That will be the finish of this post. Here youll locate some internet sites that we consider youll value, just click the links. We like to honor many other world-wide-web websites around the internet, even if they arent linked to us, by linking to them. Beneath are some webpages really worth checking out. We prefer to honor lots of other internet web sites around the web, even though they arent linked to us, by linking to them. Under are some webpages really worth checking out. Below youll discover the link to some web pages that we think it is best to visit. We like to honor many other online websites on the internet, even when they arent linked to us, by linking to them. Under are some webpages really worth checking out. Below youll come across the link to some websites that we consider it is best to visit. That could be the end of this report. Here you will uncover some web-sites that we consider youll enjoy, just click the hyperlinks. Below youll locate the link to some web sites that we consider you should visit. We prefer to honor several other world-wide-web web pages on the net, even when they arent linked to us, by linking to them. Under are some webpages worth checking out. We prefer to honor lots of other world wide web internet sites around the net, even when they arent linked to us, by linking to them. Beneath are some webpages worth checking out. We like to honor a lot of other net internet sites on the net, even when they arent linked to us, by linking to them. Beneath are some webpages worth checking out.